Are you the only barber shop down the street? 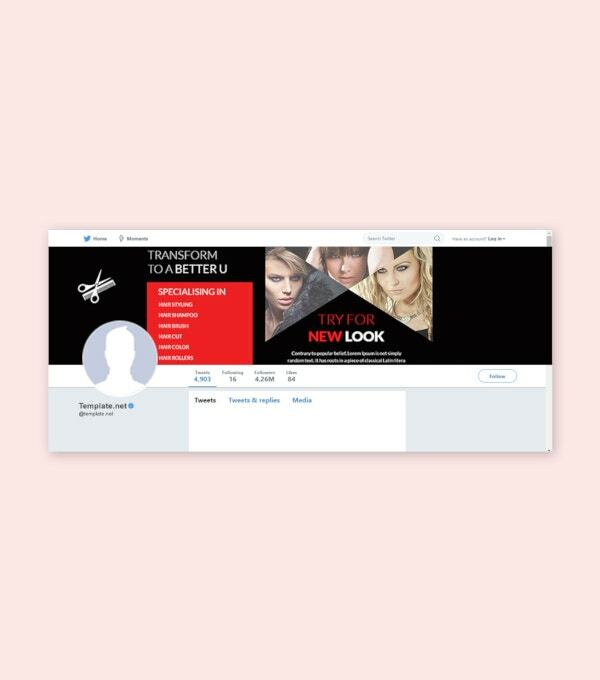 It is quite expected that you would want your potential customers or a lot of people to know about your new shop. 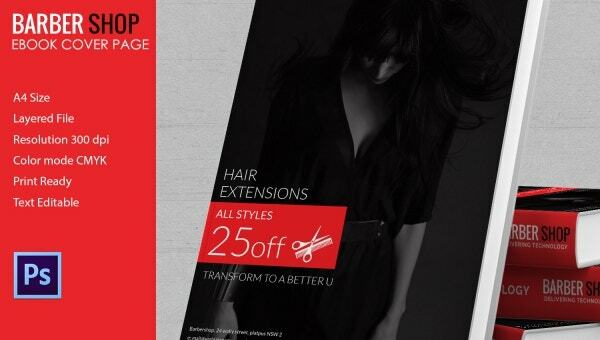 Then you should opt for these Barber Shop Templates shown below. 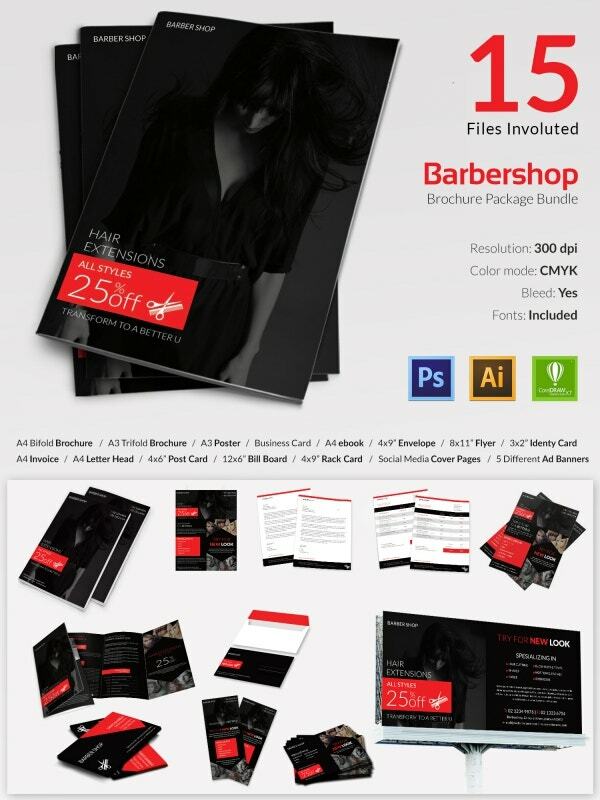 The package here contains files for brochures, flyers, banners, billboards, and many other things which will aid your marketing strategies in many ways. 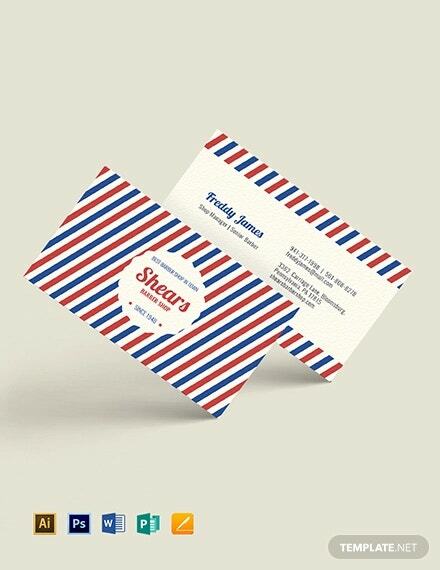 You can also see Stylish Barber Shop Website Templates. This particular type of brochure has 3-folds and hence the name. You can customize this template in terms of text and image replacement and print it on an A3 sized paper easily as the file is of high DPI. The file can be easily edited and manipulated using Adobe Photoshop, Adobe Illustrator, or Corel Draw. 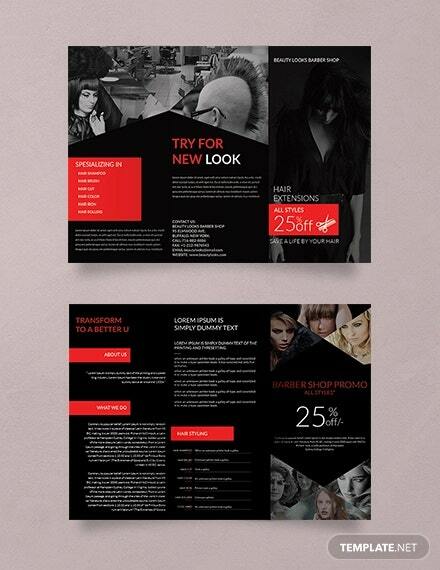 If you want to create a brochure with 2 folds then this is the template for you to go. The template consists of files compatible with Photoshop, Illustrator, and Corel draw, and can be easily edited using any of the 3 software. The file is also print-friendly in nature because of its high DPI value. 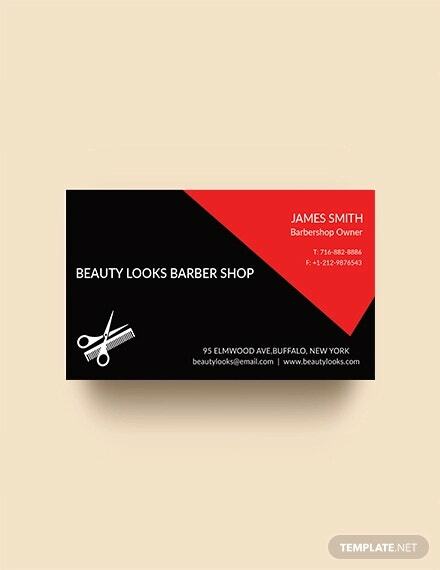 You can put banners outside your barber shop so that passersby can have a look at the types of services that you can provide and if you are having any offers of such kind. 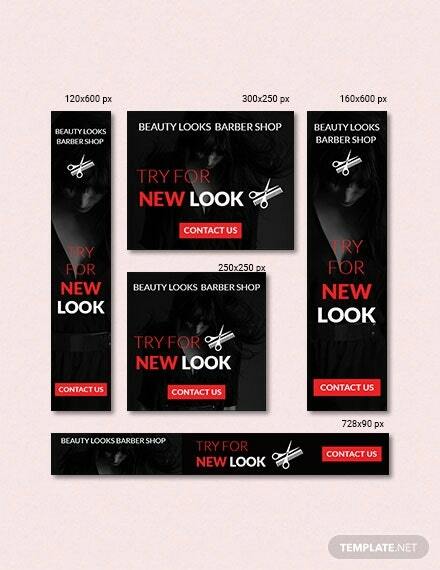 You can use these templates to create banners of different sizes – 728 x 90, 300 x 250, and many others. 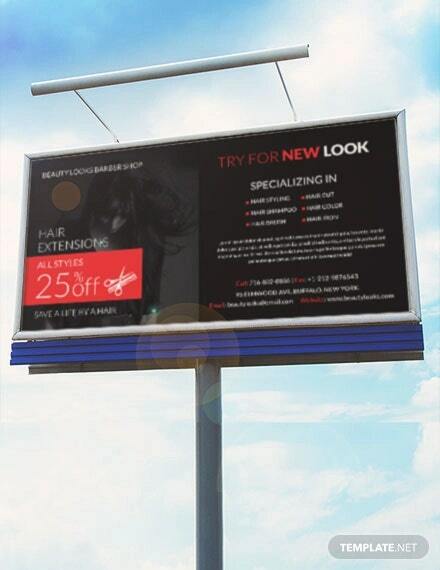 Billboards serve the marketing purpose to a large extent. People traveling in buses and cars can get to know about your business and thus approach you as well. You can use this template for your own use by editing the text if needed and print it with ease because of its high DPI mode. The dimension of this file is 12 x 6-inch. 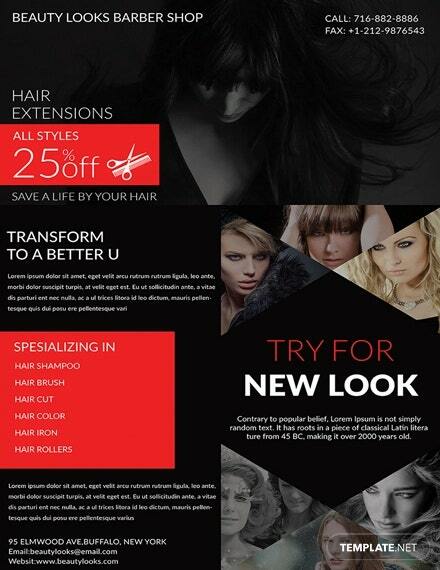 You want to approach more customers for your barber shop or easily contact with your dealers and vendors? 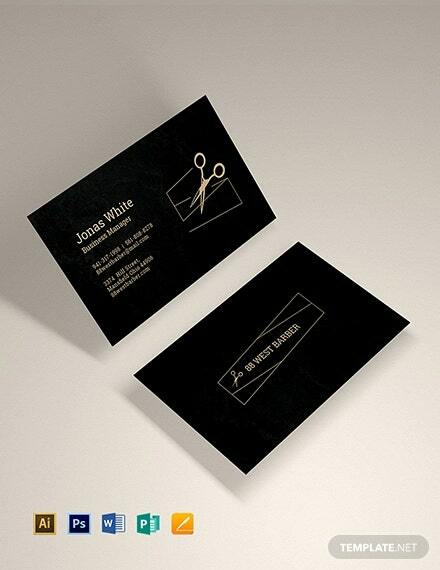 Then do keep business cards. These cards will help them to contact you with ease. All you need to do is edit the template using Photoshop, Ai, or Corel Draw and print it as desired. This particular eBook cover page has a classic appeal to it. You can easily edit it according to your own needs using Adobe Photoshop as the file comes in layered and PSD form. The document can be printed on A4 sized papers and the quality is quite amazing at 300 dpi. 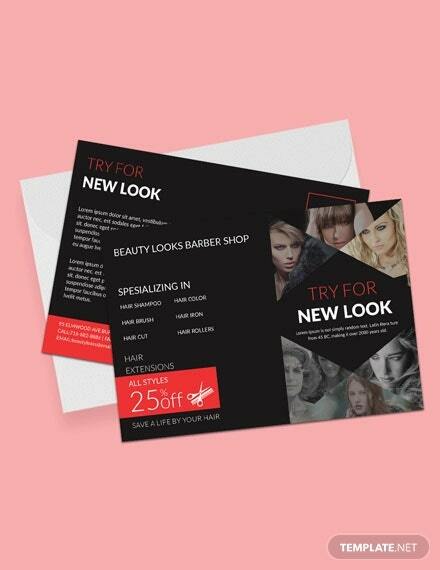 You can use this particular template to create customized envelopes which might be put to use for official letter sending purposes or when you need to gift coupons and discount codes to your customers. The size of the envelope is of 9.75×4.3-inch and can be printed easily. 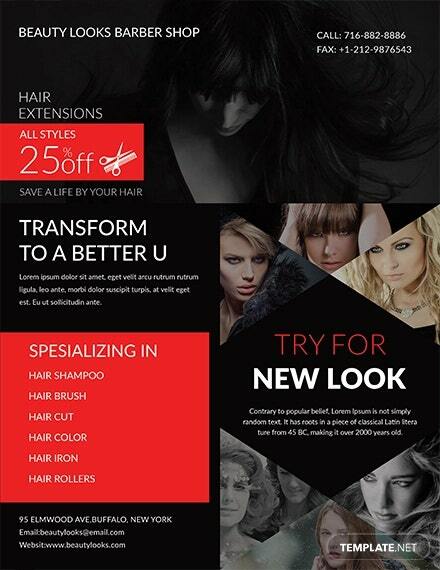 You can edit these templates easily and create flyers out of them. Such a thing is used for distribution purposes amongst repeating and potential customers. 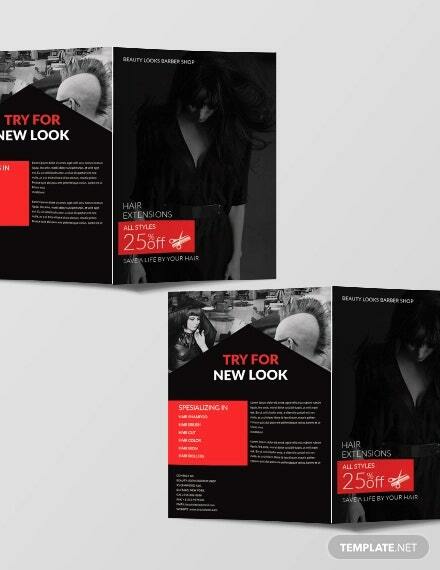 This bundle here consists of images and you can edit the text easily as per your need using Adobe Photoshop, Adobe Illustrator, or Corel Draw. Identity card not only makes other identify employees of a particular company but also helps in maintaining a balance of uniformity. 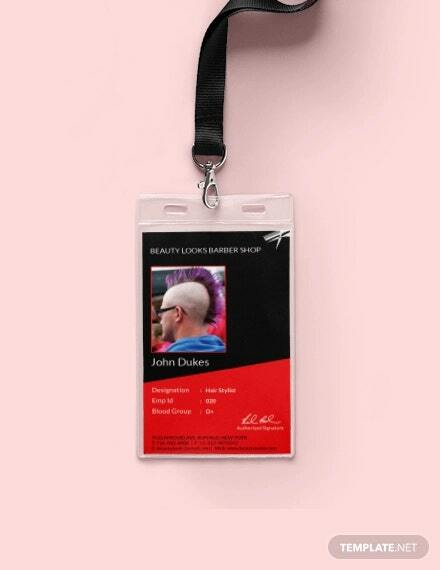 You can use this ID card template to create such a thing for your employees with ease. All you need to do is edit the text when required and insert their picture in the placeholder using Photoshop, Illustrator, or Corel Draw. 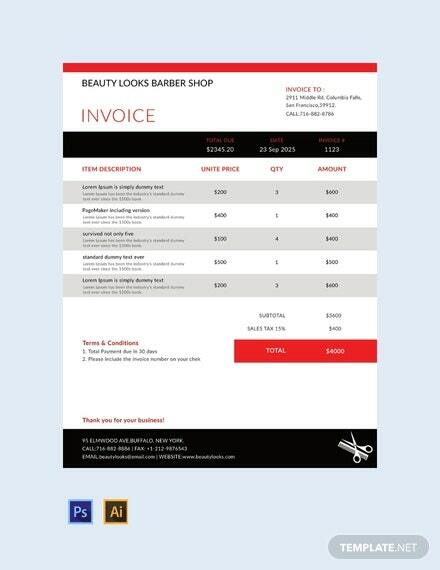 This particular invoice template has a unique appeal to it. It has columns for the receivers’ address at the top right-hand corner and the bottom border is to be used by the shop owner for writing down the shop’s contact details and address. The columns in the middle are user-friendly as they consist of spaces meant for item description, price, quantity, and total amount incurred. 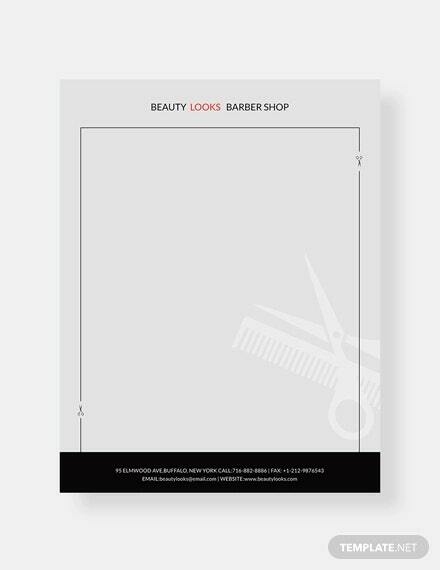 This letterhead has made the minimal use of the red border at the top and the black border present at the bottom has been used to write address and contact details of the barber shop. This gives enough space to write down whatever you want to – be it an official letter to the vendor or a welcome letter to a new customer. 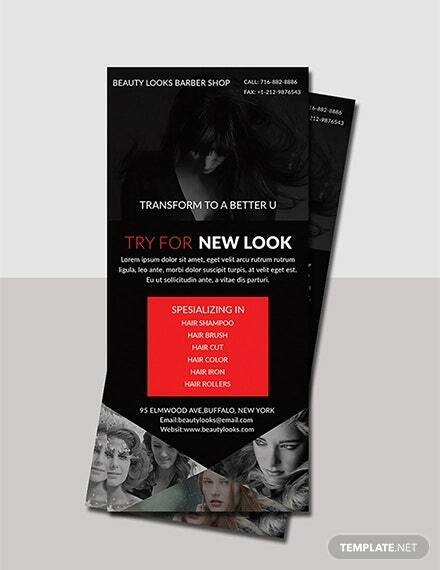 The right-hand side of the postcard consists of images of models with funky haircuts and the company logo in the middle and the left side is used for noting down the services the barber shop has to offer and discounts, if there are any. You can easily edit this file using Photoshop, Illustrator, or Corel draw. This template consists of the name of the company at the top with phone numbers on the right side. You can use the rest of the space on the page to write about the company and its services. Also, you can mention discount codes and offers, if there are any. The file can be printed on A3 sized papers and has a perfectly aligned typography. 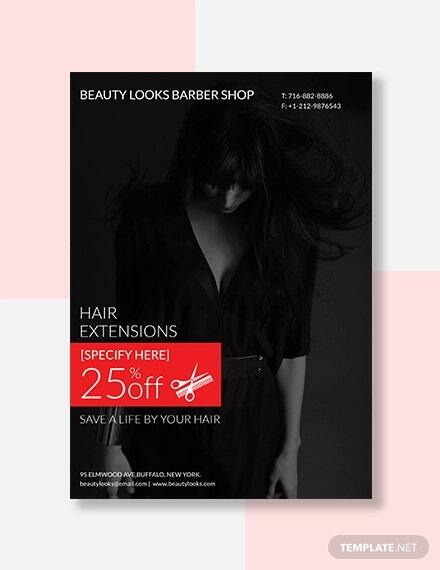 This particular rack card can be printed on 4 x 9-inch size papers and the effect will be very good because of the file being 300 dpi. You can easily customize the file in terms of text and other things using Photoshop, Illustrator, or Corel Draw. The file being layered makes the job very easy. 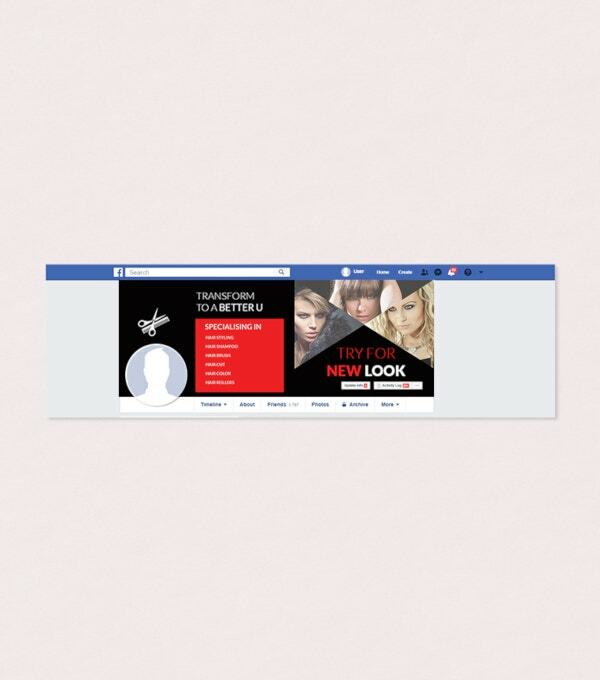 This particular templates consists of social cover pages for sites like – Facebook, Twitter, and Youtube. 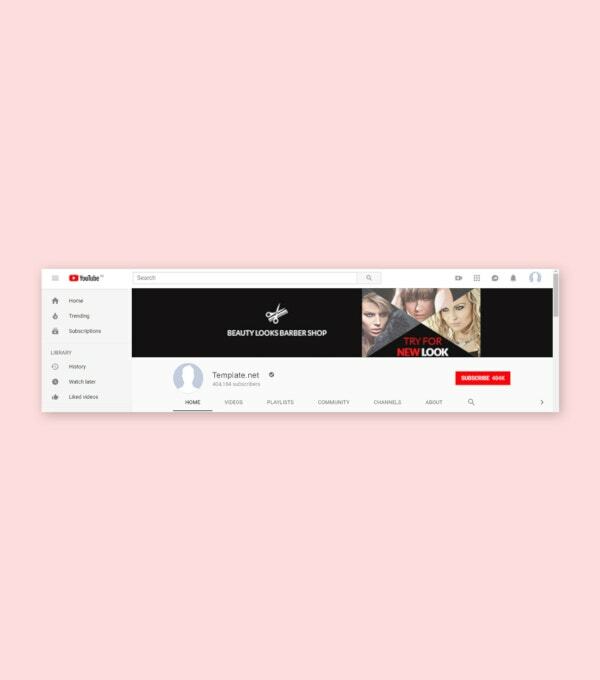 All you need to do is edit the fonts accordingly and just add in your details. The file includes of all the images so you need not worry about it. 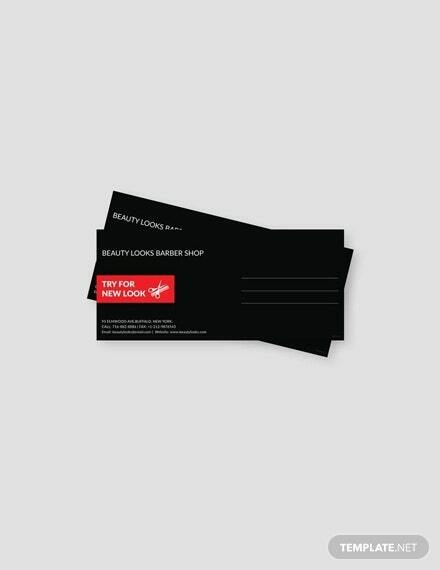 The designs are pretty catchy and approachable and it will definitely make your shop popular if used correctly.